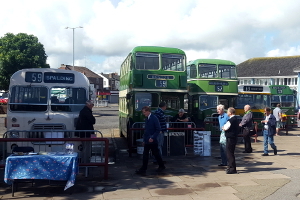 A selection of buses owned by the Society and our members will be out and about on Saturday 1 September and will be offering free rides, bringing the once familiar 'Tillings Green' of Lincolnshire Road Car back to Sleaford for the day, along with the blue livery of Delaine's, who operated the Bourne - Sleaford service jointly with Lincolnshire for many years. Please come and see us and the buses. We will be at Sleaford Railway Station, and offering short, free, local bus rides from 10.00 am to 3.00 pm - passengers will only be picked up and set down at the Station, except on the 1.00 pm journey to Ruskington which will also pick up at the North Kesteven District Council offices, for people visiting the Sleaford Classic Car and Motorcycle Show. 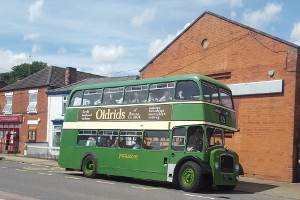 Bus workers present and past and their families are most welcome - feel free to bring along any old photographs, memorabilia and memories of the 'Lincolnshire' buses or other local operators. Our thanks to North Kesteven District Council for their assistance in staging this event. The first Leyland double decker to be bought new by Delaine Coaches, this bus ran in service until 1978. In 1990, after being in private preservation, it was re-purchased by Delaine in 1990, and in 1992 returned to PSV status for special events. It is now part of the Delaine Heritage Trust collection. Ordered by Enterprise Passenger Services, Scunthorpe, but delivered after Road Car had acquired the Company. This bus, with 'dual purpose' seating, allowing it to be used on summer weekend services to the east coast, ran briefly in Enterprise's red/cream livery (and as far as we are aware, without fleetnames) prior to repaint into Tillings green livery. After non-public use, this bus came to preservation in the early 1970s. New in 1977 as one of Lincolnshire's large fleet of Bristol LH buses for single deck routes which did not justify a 'full size' single decker, No. 1045 served at a number of depots, including a spell in a special 'Newton Rider' livery for Grantham area services. No. 1045 was withdrawn in 1993 and began a second career as a driver training bus with Derby City Transport, passing to Arriva Derby. Withdrawn in 1999, it passed in to preservation, and after some years in 'National green', it currently wears post privatisation green / white / yellow livery. The 'FS' model was a later version of the 'Lodekka' design, and this is one of many specified by Lincolnshire (and neighbouring company 'Eastern Counties') with 5 cylinder engines. Withdrawn in 1977, 2378 ran for a year in service with J.P.Williamson of Gauldry, Newport-on-Tay before passing into private ownership. An unexpected return to passenger service came in 1986 with Stagecoach of Perth, followed by a spell with Stagecoach subsidiary Magic Bus in Glasgow, latterly as a driver training bus. In 1991 it returned to preservation, and having been based at Boston depot for much of its service life, it has been restored with the Oldrids advertisement it carried in service. New as a coach, and used for private hire and express services, 2609 was one of a number of Lincolnshire's coach SCs rebuilt for 'service bus' use in 1970, and was withdrawn in 1972, and after sale in 1974 had subsequent owners in Northampton and Sunderland before returning to Lincolnshire for continuing preservation.. Please be aware that most of our historic vehicles were not designed with modern levels of access in mind, and do not have space for unfolded wheelchairs (or baby buggies / push-chairs), but our conductors will offer what help they can. We will make every effort to run the vehicles listed, but reserve the right to substitute or withdraw vehicles if circumstances dictate.